Most public NRGpilot™ SmartGrid energy portals do not require any login to view the main screens. In a browser enter in the site name in the format mysitename.NRGpilot.com An easy to remember site name is created at time of order. It is shown on the gateway label inside the NRGpilot enclosure along with a setup username and password. It is also shown in the configuration paperwork in the enclosure document pouch. The password can be changed after installation. To make changes to the configuration, enter the site URL in a browser, click the SETUP tab and enter the username and password for the site. This password is only required to make changes to settings, the slideshow etc and should be kept confidential by the owner. If you are trying to change settings for an individual NRGpilot™ energy portal and do not know the username and password, access the site through a browser in the format mysitename.NRGpilot.com. Click the SETUP tab and select the Forgot your password link? If you enter the email that was registered to the owner when the site was created it will be sent to you. 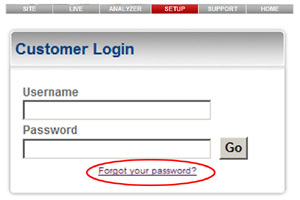 For a SMART Enterprise or WebFilm® account, click the Forgot your password? link below the NRGpilot™ login on the homepage Login and enter your registered email. If you cannot retrieve your login by email, contact Cachelan with suitable identification for assistance.